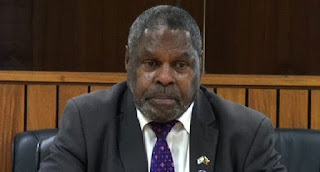 Chief Justice Sir Salamoa Injia said yesterday that medical conditions of three leaders in jail at Bomana were not serious enough to warrant immediate release on bail. He said this when he denied bail to Western governor Ati Wabiro and two others who were sentenced to 10 years jail for conspiring and misappropriating K7.06 million. On Wednesday, lawyers who were representing Wabiro, Modowa Gumoi and Norman Carl May made submissions highlighting the trio’s medical conditions. Mr Wabiro has been suffering from asthma, type 2 diabetes, dyslipidemia, hypertension and coronary artery disease since 2008. Since 2014, Dr Gumoi has been diagnosed and was undergoing regular specialist care for hypertension, hypocholsteolemia, transient ischemic attack and sinusitis. His doctor advises that he is not to be exposed to stressful circumstances which could aggravate his condition. Mr May is suffering from diabetes, blocked coronary artery disease and heart condition and high blood pressure. His doctor advices that he has high risk for a coronary event and should stay in close proximity to a facility for monitoring blood pressure and cholesterol. It was submitted that the trio’s conditions constitute exceptional circumstances that Bomana jail does not have the resources to treat. However, the Supreme Court denied their bail application as the interest of justice demands they remain imprisoned while their appeals were being fast-tracked to a hearing. “I am not convinced that their medical conditions have reached such an advanced stage that it threatens their lives. The services available from the Port Moresby general hospital are located within close proximity to Bomana jail and can be easily accessed with assistance from jail authorities,” Sir Salamo said. He pointed out that there was also opportunity for self-help measures and quoted a passage from the Potape v State judgment in which doctors advised that the bail applicant “has to do regular exercise, control his diet and avoid salt. And reside at a place where he would have easy access to a cardiologist and he is required to be monitored on a three monthly basis”.